Get $10 gas card reward on all flight tickets to Montreal. Offer expires on Dec 31, 2018. 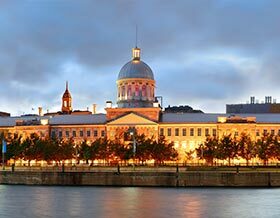 Montreal is the largest city in the province of Quebec with a population of more than 4 Million in the Montreal Metropolitan area.Montréal is the second French speaking city in Canada's Québec province after Paris. 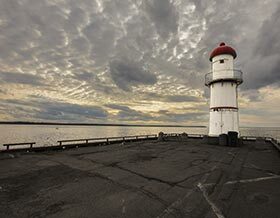 Montreal sets on the excellent harbour of Saint Lawrence River and which is named after Mt. Royal, the triple-peaked hill. 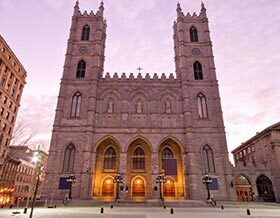 It’s a French colonial Vieux-Montréal – with the Gothic Revival Notre- Dame Basilica at its centre – to Bohemian Plateau. 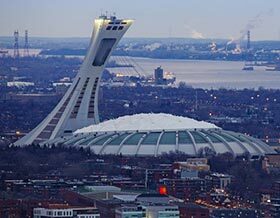 We have deals negotiated from all airlines and offers best deals for flights to Montreal. Air Canada, West jet and Porter airline operates all domestic flights from Toronto, Ottawa, Edmonton, Halifax, Fort mcmurray, Winnipeg, Victoria, Saint john to Montreal and from Montreal. Air Canada, Swiss airways, Air India, Air China, United, American Airline, British airways, KLM, Delta, Air France, Turkish airline, Qatar airways operates International flights from Montreal. Some airlines uses Air Canada and Westjet as connecting airlines to Toronto Hub from Montreal airport for their International flights. Montréal–Dorval International Airport, is a Canadian airport located on the Island of Montreal, it’s just 20 km from Downtown Montreal. The best times to visit Montreal: March - May & from September – November. 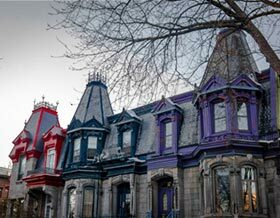 Refer to our Complete step by step travel guide to Montreal. Welcome to the festive city of Canada. Are you in need of local currency? Don’t be concerned about exchanging your foreign currency at the airport. You can make use of the following outlet:ICE - It has 7 locations within the airport. 5 of them within the public area and 2 being the restricted area International and United States at Gates 52 and 76 respectively. All 7 counters offers the “Click and Collect” service by which a passenger can book his currency online and pick up his order at the airport. ICE has over 25 international currencies available with them. If the cost of your air tickets drops after you purchase your tickets from us, we'll give you a $100 credit to spend on the next flight you book with us. We are one of the most economic flight ticketing agencies in Canada. Our Secret to lowest pricing to Montreal is connecting with multiple suppliers and multiple GDS (Global distribution systems Sabre, Amadeus) to shop the lowest fares and offer the cheapest airfare to our consumers. Now that economies are beginning to recover on a global scale from the recession that affected virtually every nation on earth, people are becoming more comfortable again in participating in activities that they had "put on hold" for a while. One such activity that may have been deemed a 'luxury', and consequently set aside until the economy improved, is longer trips involving air travel. Travelers who may not have flown for a while may be overwhelmed by how air travel has changed. Depending upon the breadth and complexity of travel plans, especially when plans may incorporate air, hotel and rental car considerations, the whole process can be very difficult for some travelers to negotiate. For some travelers that take to the sky, the flight is part of the overall travel experience, flyers paying a handsome fee for select flights, going first class, and the like. But there are a great number of people that just wish to get from Point A to Point B and back at the cheapest cost, preferring to spend that extra money during the vacation they're going on. 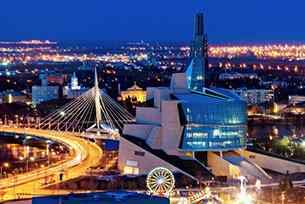 What they need is comfortable and cheap flights to Montreal from Toronto and other cities of the country. 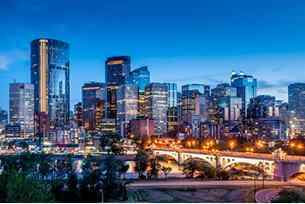 The very best way to now book a flight that will have the guaranteed lowest price available in the Canadian market is to book the trip with us, as we specialize and excel in providing the lowest airfares guaranteed. We offer a 100% Safe Shopping Guarantee. We offer Price Drop Guarantee up to CAD 100 per ticket. We offers cheap flights on a great number of major airlines, not just regional "puddle-jumpers" that land at out-of- the-way airfields. And if the traveler is looking for deals on cheap hotels, the cheapest car rental deals, or vacation packages, we will be more than happy to look into those as well. 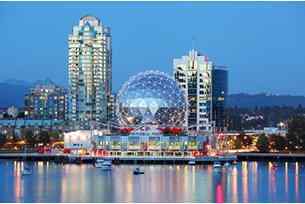 Travelers can save hundreds of dollars by going with us and by booking cheap flights from Vancouver to Montreal. In Montréal a simple stroll is a journey through time, with every step an opportunity to experience something to your liking. 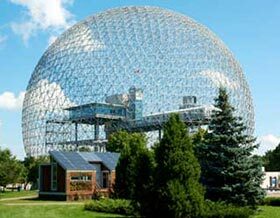 Historic monuments intertwine with ultramodern structures, while the legacy of Expo 67 still lives on, from the geodesic dome designed by Buckminster Fuller to Habitat 67, a landmark in Canadian architecture. Don’t forget to check out Montréal’s new jewel of urban design, the Quartier international. 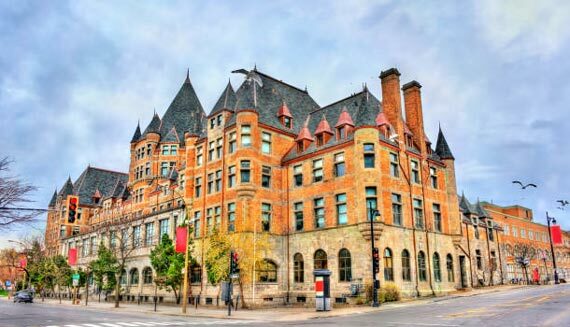 If you like food, Montreal is a culinary mecca and has a huge variety of options, from diners and fast food to low-cost ethnic restaurants to haute cuisine. The city was recently ranked 2nd best dining city in North America after San Francisco and ahead of New York. 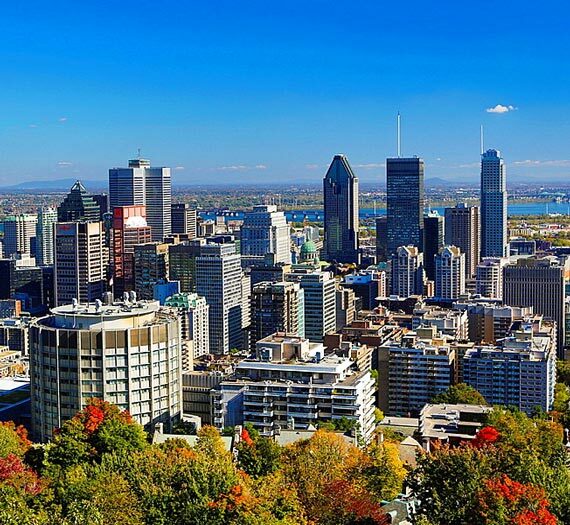 The first step towards enjoying the rich culture, popular vacation spots and the culinary of Montreal is to book your flight ticket to Montreal (YUL) through NanakFlights. Promenades Cathedrale - Shopping centre featuring apparel & accessory stores, plus a food court. Place Versailles - Mall featuring stores with clothing, accessories, electronics, home goods and restaurants. Underground City - One of the best shopping malls in Montreal. Boulevard Shopping Centre - Mall with more than stores & restaurants ranging from fashion boutiques to small shops. 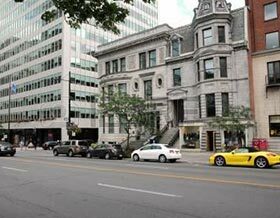 Place Montreal Trust - It is part of a chain of stores. A 5-storey mall. Centre Rockland - A good place for quick shopping. 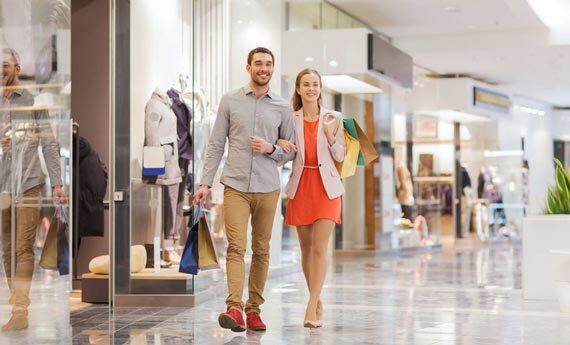 Complexe Desjardins - Shopping complex featuring apparel, accessories & housewares stores. Also, has a food court & a grocery store. To get flights updates at Montreal Airport (Montréal–Pierre Elliott Trudeau International Airport YUL), check the arrival and departure time of domestic and international flights. It's a nice park which is 233 meters above the City. 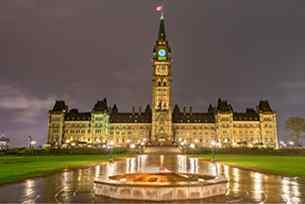 The tourist visit here to do handshake with historical Monuments of King George VI, Jacques Cartier & to spend some time at Lac-aux- Castors. Seashells-Shaped Olympic Stadium in the Heart of the City. 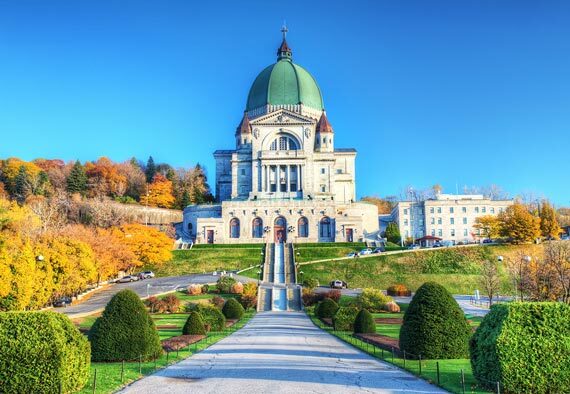 St. Joseph's Oratory: Mecca for Pilgrims | Dedicated to Canada's Patron Saint | Renaissance-style domed basilica dating since 1924. Built in 1894 | Mirror Version of St. Peter of Rome | Catholic Mary Queen of the World Cathedral lies in east of Place du Canada. 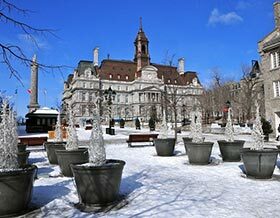 French-Canadian residential quarter | Square Saint-Louis rates as one of Montréal's prettiest old squares. Since 1825 | Located on Southeast Bank of Montréal Island. Dates from Late 1860s. | Centered on Rue de la Gauchetiere. 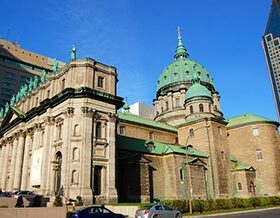 Founded in 1656 | it is the Oldest Church in Montreal. 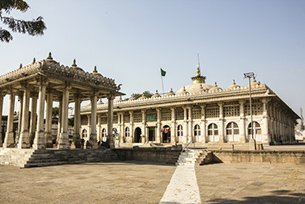 It is Awesome Place for Family Attraction. Remarkable Concentration of buildings dating from the 17th, 18th, and 19th centuries. Outstanding Collection of Exhibits of Canada's Social History. 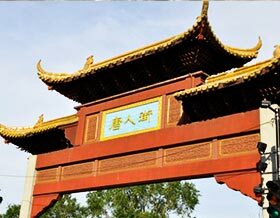 Evergreen Tourist Spot | Historic Architectural buildings | Gardens | Restaurants. 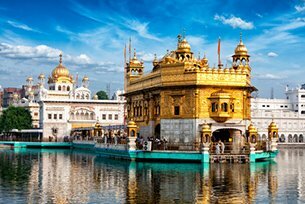 For its plenty of flavorful herbs and spices, Indian food is specifically loved by people of Montreal. And Bombay Mahal is one the greatest Indian restaurant you can eat in. The restaurant serves family style comfort food that can be shared amongst great company of friends and family. Set in an impressive atmosphere, the extensive menu dishes will surely satisfy your palate. If you have never tried Indian food, butter chicken served at Bombay Mahal is an excellent dish to initiate the love you would definitely fall into. Don’t forget to accompany it with fresh baked fluffy flat bread called nan to enjoy thhis deliciously creamy Indian chicken preparation. Joe Beef- the Bohemian bistro - is one of the most known and cherished restaurants in Montreal. Joe Beef serves much more than just the classic seafood and steak dishes. The signature dish at this restaurant is the very popular Joe Beef Fole – gras double down. It includes cheese and bacon with a topping of chicken skin mayonnaise that is sandwiched between deep fried slabs of fole gras with generous maple syrup. Apart from this, lobster spaghetti and tournedos the cheval - which is horse meat in bacon, also make the must-try dishes from the menu at Joe Beef. This restaurant is best known for its tremendous flavors and great presentation of food that they serve. Even if you order simple bread and butter, it would win your heart to be beautifully flavored and presented. The main cuisine served here is French coastal cuisine that includes best of sea food and some creative dishes. 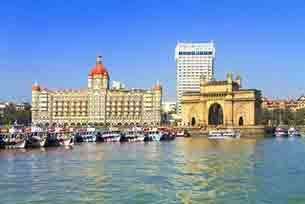 The service is impeccable and the overall ambience is impressive and highly contemporary. The most popular dishes at Restaurant Europea include creamy lobster cappuccino topped with rich truffle puree. Punjab Palace is yet another Indian restaurant in Motreal that has been serving scrumptious Punjabi style Indian food for more than 20 years now. When you are here, the whiff of their tandoori platters and roasted kebas will unsparingly catch you with tantalized taste buds. You can order a mixed plate of chicken and lamb seekh kebabs for a filling meal with some baked flat breads. You should also try the vegetable pakoras that are vegetable fritters served with tangy sweet sauces. 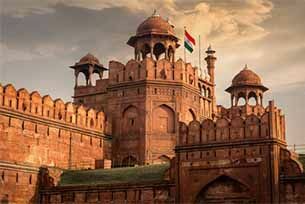 Punjab Palace is the best place to eat authentic Indian food as it is made and served in any Indian home. No matter how un-photogenic it may be but Poutine definitely is the most loved Quebecoise specialty. La Banquise is the best place in Montreal to enjoy a bowlful of humble yet very intriguing poutine. Poutine is a great comfort food that has crispy fries loaded with flavorful gravy and topped with healthy and generous topping of cheese curd. Started in 1968, La Banquise now serves over 20 smashing varieties of classic poutine with terrific toppings such as bacon, smoked meat, steak, fresh vegetable and much more. La Banquise is the best place to enjoy hearty traditional Montreal flavors. Locals & Visitors hangout for sandwiches feel like gourmet fair | Flock to this Spot for Breakfast - Brunch - Lunch. Host Live Musical Acts with Awesome Food |on St-Paul Street. longest standing restaurants in Old Montreal - About 40 years! Romantic Ambience | Best Quality Sea-Foods & Meat Dishes. Awesome Twist on a Quebec classic | Poutine - a Lobster Poutine! Great Pick for Lunch | Grab a Bite & a Beer. 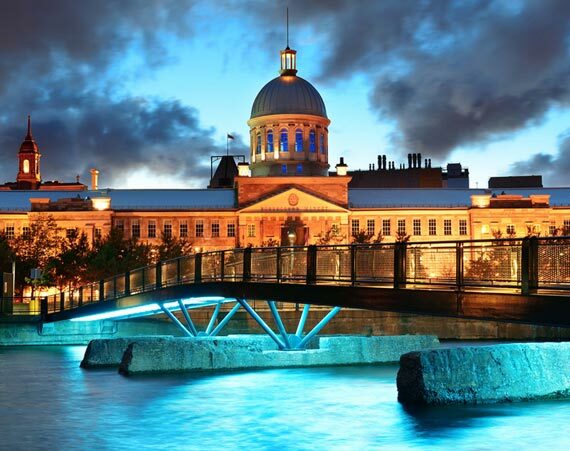 Travel documentation requirements for traveling to Montreal(YUL), Canada. If you are Canadian Citizen, You must carry a valid Government issued photo id with you. For some great theater and arts experiences, try the Théâtre D’aujourd’hui, and check out the Montreal Theatre website. There's plenty to do through Montreal. Explore downtown and find amazing restaurants and cultural attractions just by walking or biking through the city. Tour the city's historic districts for breathtaking culture and history. For any information regarding Montréal–Pierre Elliott Trudeau International Airportt, Please visit the Montréal–Pierre Elliott Trudeau International Airport web site. Please watch our youtube video for places to visit in Montreal. 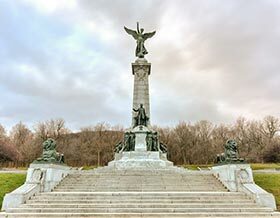 If you are planning to stay close to the Airport in Montreal, the following is the list of the best hotels close to the Montreal Airport. We are RATED 4.5/5 by 1126 Google reviews for a reason. 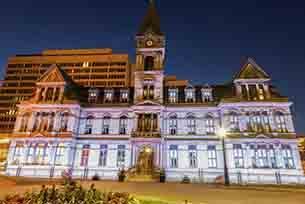 Book your Flights to Montreal with confidence with us.